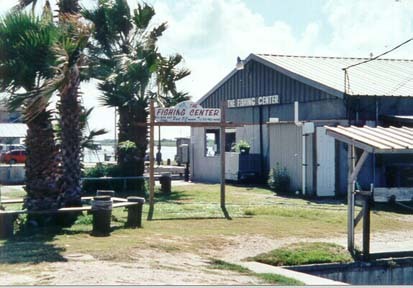 The Fishing Center is a one stop shop for all your fishing and recreational needs. We are located at 13th Street and the Intracoastal Waterway (ICW) in Port O'Connor, Texas. Our facilities include: boat ramps, RV Park, boat slips, cabana, fish cleaning tables, and on the water fueling. In the thriving metropolis of Port O'Connor, the Fishing Center can be an interesting source of entertainment for locals and tourists alike. Boating and fishing enthusiasts often gather to share "truthful" fishing stories and (not) always helpful tips and techniques. For the nature loving spectator, porpoises (a.k.a. dolphins) frequently use the water adjacent to the Fishing Center for synchronized swimming practice. On weekends, crowds gather to drink their favorite beverage and cheer for fisherman as they attempt to load their boats. We invite everyone to come by, visit, and join in the fun. Directions: Take Highway 185 South to Port O'Connor. Take a right on Fifteenth Street towards the ICW. When Fifteenth Street dead ends into Water Street, take a left. The RV Park will be on your left and the marina on your right. Proceed 2 blocks and the Fishing Center is on the right.